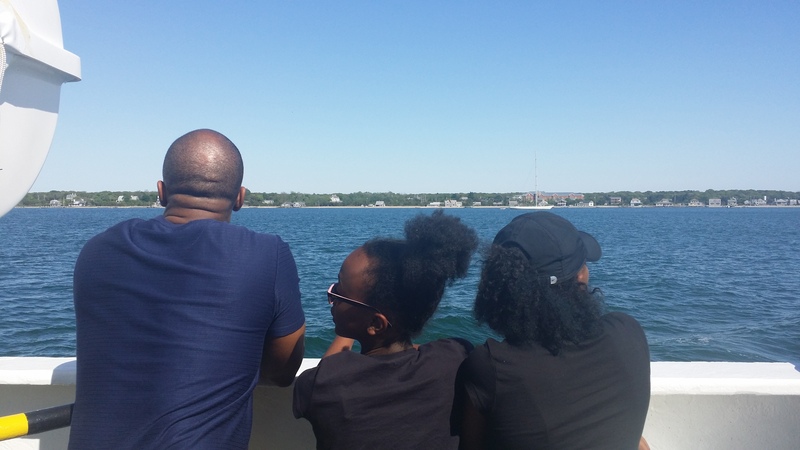 We kicked off our summer vacation with our very first visit to the New England coast and the lovely island of Martha’s Vineyard. We managed to time our visit right at the beginning of the summer season which officially begins around mid June although the tourist scene begins to awaken from its winter slumber during the week following the Memorial weekend holiday. Thus, we were greeted with curiosity by the local shop owners and restauranteurs who wondered why we were here so early. “Yeah, we just opened,” they kept telling us, apologizing for not quite being fully operational. But, limited store hours and minimal island offerings notwithstanding, we eeked out a Vineyard vacation just the same! The weather was even working against us this week. The forecast had promised sun and 60s which we got a peek of here and there, but the clouds and rain persisted as did the cool–okay, cold–but we would not be deterred! This place is lovely, rain or shine! The cottage-style homes, the quaint bed & breakfasts, the cozy holes just welcome you. Our accomodations were perfect, on location in Edgartown, near little shops and boutiques and facing the ocean (although next time I’ll get a room one floor up so I don’t have to stand on my tiptoes to see the “oceanview” we were promised!). We also found some GREAT eating places–Sharky’s for fattening Tex-Mex, Biscuits for yummy breakfast (two words: French toast, I’m through!) and the Copper Wok for the best sesame tofu and fried rice you’ve ever tasted, bar none! 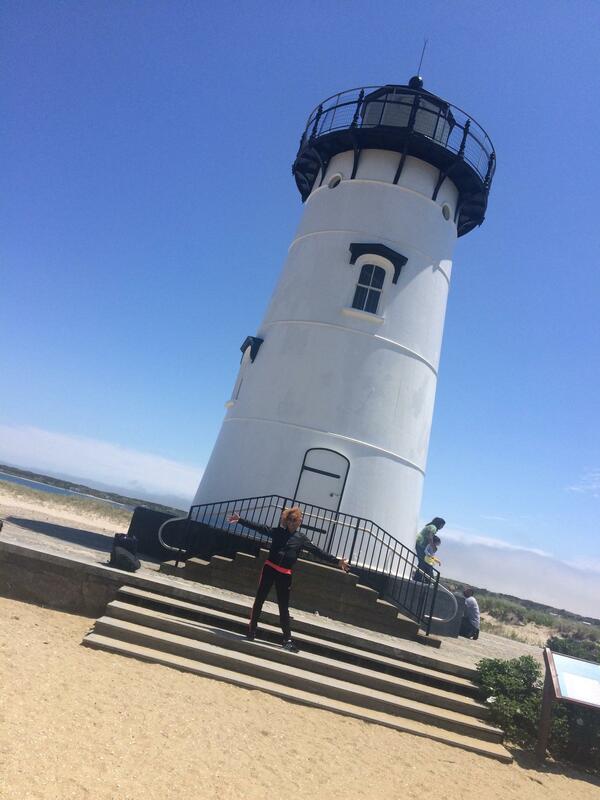 But, I must say, my favorite thing was the lighthouses! I think they are so beautiful and inspiring. Each one has a history and a story. The lighthouses also gave us a perfect reason to tour the island. Since the weather didn’t permit bike riding or beach time, we instead crisscrossed several towns–Tisbury, Oak Bluffs, Acquinna and Vinyard Haven in search of the historic lighthouse sites and stumbled upon a few other interesting places along the way (which I will talk about in future blogs). The Martha’s Vineyard online magazine calls the lighthouses “working monuments” of history, an appropriate moniker, I think, considering their sole purpose is to provide a beacon for travelers who either lose their way or are unaware of lurking dangers. Such was the case with The Gayhead lighthouse erected in November 1799. So many lives were lost because of an “underwater ledge running from cliffs westward” that mariners referred to it as the “Devil’s Bridge,” but Gayhead’s bright beams outshined that menace and has spared many over the years. Meanwhile, the East Chop lighthouse was the lighthouse the government didn’t want! They thought the West Chop lighthouse was enough! But, the relentless Captain Dagget raised the funds himself to build it in 1869. Through valiant effort he proved it’s worth and it’s still praiseworthy today! Then we awoke on June 1st to a bright sun beaming through our windows! 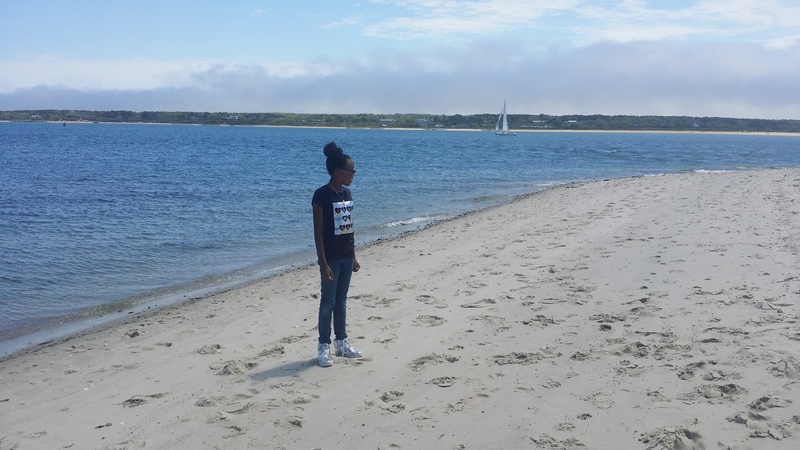 What is it about the month of June in Martha’s Vineyard? So, of course, we trekked back and got a better and brighter pic, woohoo! According to island lore, this lighthouse was built on a manmade island in 1828 and the path that leads to it was dubbed “The Bridge of Sighs as couples drew out their goodbyes on the walk to the lighthouse before being separated for weeks, months, or forever by whaling voyages.” Such a sad story to be associated with such a pretty place! 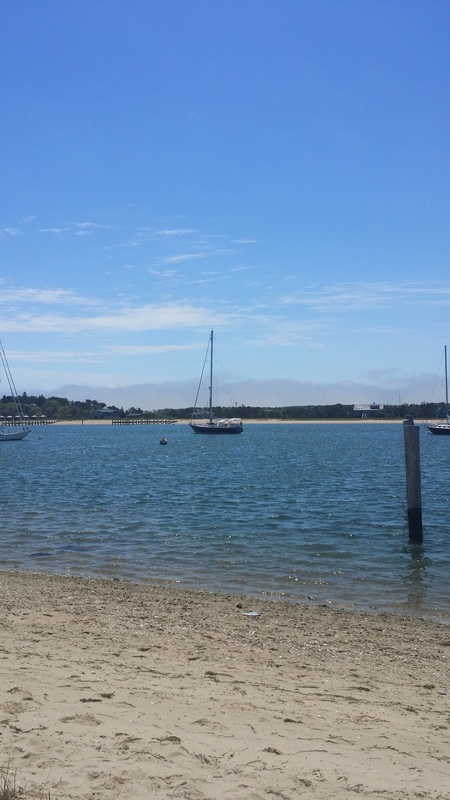 And it is an absolutely gorgeous spot, surrounded by sand with a port and sailing boats on one side and a beach and the open ocean on the other. Despite the beauty of the place the lighthouses are reminders that life is fragile and fleeting. They stand as beacons that beckon weary travelers to safety. For those, like us, who arrive they are symbolic of a safe haven while also a memorial for those who never return. During our visit to Martha’s these bright structures beckoned us. They invited us to stay awhile, to listen to their stories and understand their purpose–how they came to be and what they’ve come to mean to the people who have relied on them for their very lives. By the time we pushed off from the dock and watched the coastline fade into the distance, we were nostalgic, but also determined that we must return, because there is still more to see and do. After all, our stories and discoveries have really only begun! Raven is a student in my Creative Writing class and this is her personal essay, a heart-breaking, yet beautiful childhood memory. She entitled it “Strands” but I think she has such a beautiful name and the story fits her name, so I have taken the liberty of re-naming it, but you be the judge. Enjoy! The school bell rings on a windy afternoon at Highlands Elementary. Recess is over and the rowdy kids are hesitant to rush back into the building. A whistle is blown and they run to their grade lines to walk back to their rooms. Lunch is over. Residues of fruit cocktail syrup can be seen on the clothing of some of the more messy students entering the hall. Tiny hands covered in playground debris, sleeves and drawstrings wet with saliva, unraveling hair and untied shoes add to the colorful display of third graders, who will be unrecognizable to their parents. The halls echo with a mixture of young, high pitched voices and the occasional mature voice playing like a broken record commanding students to enter quietly. The hall is soon still, but voices radiate from closed classroom doors as if the walls were talking. Mr. Varner, a white and tall male teacher, welcomes his students back from what seems to have been a very exciting recess. When he smiles, you can see his white crooked teeth that reveal an inviting smile. His posture suggests he is calm, but stern. It’s movie day and the feature presentation is his personal favorite, Wallace and Gromit. Once instructed, the children go over to the movie area, pick from either a couch cushion or a pillow to sit on, and wait for the movie to start. One of the students, a young dark-skinned girl, is still at her desk running her fingers through her hair, daydreaming. The teacher calls for her to join the other students and immediately she snaps out of it rushing over to join them in the movie area. As she stands up, strands of black hair fall from her small dark fingers, gently floating to the ground like leaves falling from a tree. The film is stopped after an hour and a half as it is almost time to go home. The students pile the cushions and pillows back in their designated area, head back to their seats to pack up, and wait for the final bell to sound. The young girl goes back to her seat and opens her activity book, slipping off into her own world yet again. She fiddles around in her hair and strands fall into the crease of the open book. The bell rings loudly signaling the end of a school’s day. She closes her book, puts it in her backpack and lines up. On the bus ride home, she is staring off into space yet again. As the cool breeze hits her face from the open window she pulls out a strand and rubs the end of the follicle between her fingers. It feels wet and cold. She pulls out more and examines each one, one right after another rubbing them between her fingers. The wind carries the loosened strands from her finger tips to the outside of the bus never to be seen again. She gets off at her stop, a Baptist church located two minutes from where she lives. Off the bus went, the smell of spring flowers and the sound of barking dogs fill her senses as she kicks a rock all the way home. Once home, she is greeted with a hug and a kiss from her mother. Before the television and anything else involving leisure, homework is first. Passing the living room and the floor tv that stretches her appearance as she walks by, she reluctantly heads to the kitchen table to start her homework. Sitting at the table with her mother, she takes out her activity book. The young girl holds her head down as she reads out her instructions in haste. It is then that her mother notices that something is different about her daughter. It isn’t her daughter’s shirt that is no longer neatly tucked in. It isn’t her daughter’s shoes that seemed to have been scuffed up after only one day on the black top. No. Her mother touches the back of her daughter’s hair, then lifts a handful of moistened pony tail and is shocked to find a bald spot stretching from one side of the girl’s head to the other! The mother moves her fingers across the now bare surface of her daughter’s scalp. It’s smooth as if it’s been shaven. Oblivious to the mother’s concern, the young girl lifts the activity book and hair falls like leaves from its pages. Both of their eyes are now drawn to the floor where a pile of hair lies, and back to the book that is still darkened with raven-colored strands gathered in the crevice. I suppose that’s where I got my name from–because my hair is dark like the raven bird. At the tender age of 8, I began pulling out large chunks my hair from the root and didn’t even realize it. The condition is called trichotillomania. Trichotillomania is an obsessive-compulsive disorder in which a person, male or female, has an urge to pull out their hair. It was a disorder that my mother knew all too well. Perhaps that’s why her reaction was a bit subtle. Although she was shocked, she too had the disorder, so she understood what was happening. It can start as young as my age at the time of 8, or even later in life. Compulsively, hair is pulled from the scalp, the eye lashes or eye brows. Though being pulled from the root may seem painful, it is the opposite for those of us with this condition. Pulling my hair, especially at that age, was soothing and allowed me to go deeper into my daydreams. Here, almost 20 years later, I still live with the disorder. In all of this time, I have learned self-control. While hair may not fall from books anymore, there are still visible piles that sit beside me and remind me that if I don’t snap out of it, I’ll go from being a raven to a bald eagle!